And a beautiful salad bowl to serve it in! Place the salad leaves in a large bowl. Season and dress with the Balsamic vinegar or my glaze and extra virgin olive oil. Add a few pieces of walnuts. Toss together. Place in a salad bowl to serve. 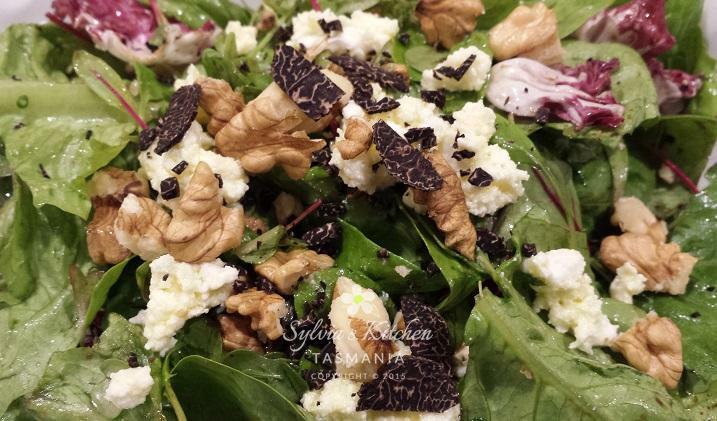 Garnish with more walnut pieces, crumbled chevre or feta and the truffle slices. Serve to accompany a roast chicken or grilled steak. Enjoy! Join our Fellow Food Lovers. Sign up to our Cooking Club. Receive newsletters and more. Be the first to learn about class updates and like us on Facebook. This entry was posted in Autumn, Local Produce, Recipes, Vegetarian, Winter and tagged Anzac Biscuits, Local Produce.